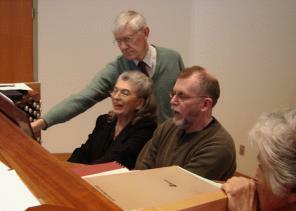 Brooks Grantier welcomes OHS-ers to Trinity Episcopal Church in Marshall, Mich.
Brian Sweetman, Bill Tufts, MaryAnn Balduf examine a remote combination action racks as Brooks Grantier explains the system. 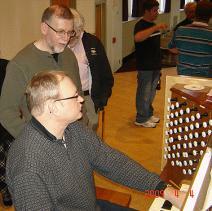 Jerrell Frederick marvels at the husky swell shade on the Trinity Church Moller organ. 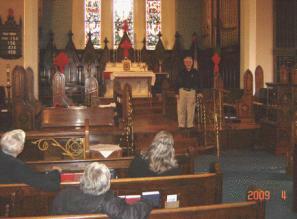 Brian Sweetman takes a turn at the Trinity Church Moller console. 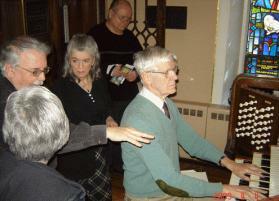 Brian Sweetman and MaryAnn Balduf play doubles on the Goodrich Chapel Moller as Jim Wilkes and Dana Hull enjoy. 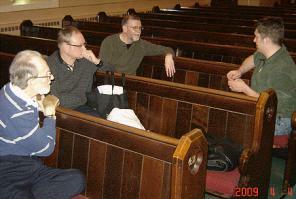 An impromptu round table is held by (l-r) Ken Holden, Terry Jamkowski, Brian Sweetman and Trevor Dodd. 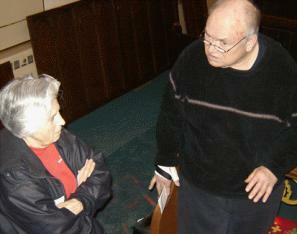 Dana Hull and Bill Tufts obviously ponder some weighty matters. 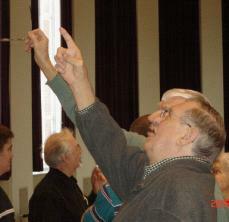 Eighteen members and friends of the Michigan Chapter of the Organ Historical Society assembled at Trinity Episcopal Church in Marshall, Michigan at 10 a.m. on April 4, 2009. To save time on a busy morning, those present agreed to forego a formal meeting. Present were Carl Balduf, MaryAnn Balduf, Gary Dodd, Trevor Dodd, Leonard Feerick, Jerrell Frederick, Brooks Grantier, Wanza Grantier, Charles Grantier, Ken Holden, Dana Hull, Terry Jankowski, John Keeber, George Seaman, Ned Spitzer, Brian Sweetman, Bill Tufts and Jim Wilkes. 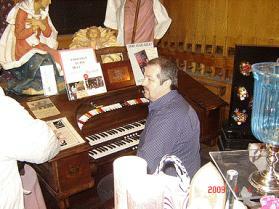 The next event of the morning occurred at The Mole Hole, a unique boutique gift shop that features a II/V Barton organ, energetically played by Scott Smith. (Listen) Then followed a delightful lunch at Win Schuler's, flagship of the Schuler restaurant chain. A mid-afternoon departure brought an end to a busy and productive OHS Michigan Chapter day. 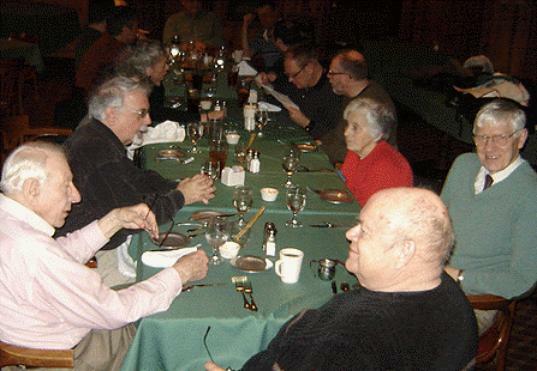 A table to infinity was necessary to seat all attendees for lunch at Win Schuler's. 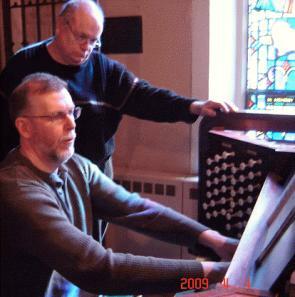 Terry Jankowski and Jim Wilkes take their turns at the organ consoles. The three manual console of the Goodrich Chapel Ernest White Moller organ. "Brooks plays and the music comes out there," so seem to say George Seaman and Jim Wilkes in perfect pointery. 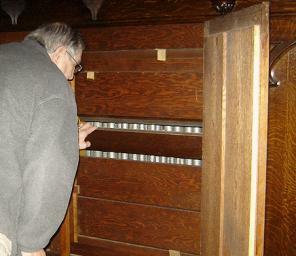 Scott Smith at the Mole Hole's Barton Organ. 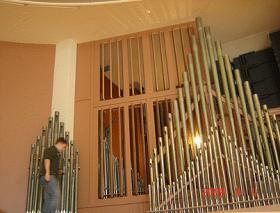 The two contrasting pipe facades are perhaps an indication of the tonal difference between the Moller Whitelegg organ in Marshall (left) and the Ernest White edition in Albion (above). 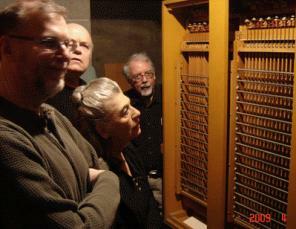 The Ernest White Moller at Goodrich Chapel gets a thorough going over by the OHS Michigan Chapter visitors.